The first three gospels record the stilling of the storm on the lake of Galilee. It is one of the most powerful and impressive of the Lord’s miracles. This was especially so for Peter, Andrew, James, and John – fishermen – who well knew, when a storm arose, the terrors of those waters. The freshwater lake of Galilee is 686 feet below sea level and less than 200 feet deep. It is bounded by high hills, from where cold winds can hit the warm surface of the water and whip up sudden squalls. Luke’s account shows this: “there came down a storm of wind on the lake” (Luke 8:23). Shallow water reacts to winds faster than deep water does, and hapless fisherman can be engulfed before they know it. 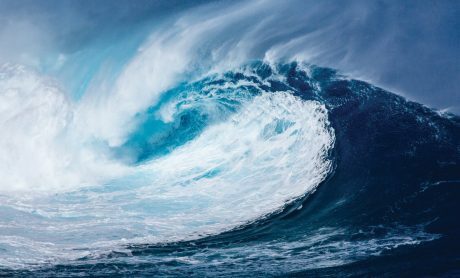 In Mark’s account we see how desperate their plight was, “And there arose a great storm of wind, and the waves beat into the ship, so that it was now full” (4:37). The next wave may have sunk the boat. The disciples felt completely at the mercy of the storm. We can spiritualise this, and apply it to our experience. a] Storms of life do come. Even to obedient disciples. Remember, they were obeying the Master in crossing the lake (Mark 4:35). We can be in the centre of God’s will and yet in the eye of a storm of trouble! Do not conclude that your maelstrom is because you have sinned. Of course, it could be, as in the case of Jonah, and it is right to examine ourselves (Job 34:32). However, it is not necessarily so, and our kind Lord would not add the burden of false guilt to our trouble (Matthew 11:29,30). b] The Lord is with us in the storm. And so can we because, “The LORD hath his way in the whirlwind and in the storm” (Nahum 1:3). He deals with us like this to subdue sin, draw us closer to Him, make us better Christians, and fashion us for the work of His kingdom. c] He has power over every storm and can easily deliver us. “And he arose, and rebuked the wind, and said unto the sea, Peace, be still. And … there was a great calm” (4:39). With His mere word our Lord stilled the storm: “Peace” spoken to the howling wind, silencing it; “Be still” to the tossing waves, calming them to a smooth surface. “The Lord of peace” is with us (2 Thessalonians 3:16). For the One who made heaven and earth no tempest is too fierce to quell (cf Psalm 107:23-31). We can be sure that, real though the storm may be, it will not be allowed to overwhelm us (Isaiah 43:1,2). Now let us consider the Lord’s searching question, “Why are ye so fearful? how is it that ye have no faith?” (Mark 4:40). He means that the disciples’ reaction showed a failure of faith. If they had believed, they would not have acted the way they did; neither would they have uttered those hurtful words, “Master, carest thou not that we perish?” (verse 38). “How is it that ye have no faith?” Does the Lord mean they are unbelievers? 1] Not in the absolute sense. These are disciples who have left all to follow the Master. They certainly are believers: the gift of faith is theirs (Ephesians 2:8,9; Philippians 1:29). As one of them was to write to Christians years afterwards, this indestructible grace was their treasure: “like precious faith with us” (2 Peter 1:1). 2] However, it was true in a comparative sense. “No faith.” Our Lord means their faith was not in exercise. Matthew and Luke have, “O ye of little faith” and “Where is your faith?” These good men failed to believe what they knew to be true: that the Son of God was there with them and that all was well. They allowed the storm, and their feelings, to take them over so that they forgot Whose they were and Whom they served! 3] This can easily happen to us. 4] This was a test of faith. It was what they saw versus what they knew was true. And, sadly, what they saw won! (2 Corinthians 5:7). It might seem that the Lord is asleep to our predicament – unaware, indifferent. But it was not so, as the sequel proved! The Lord did not need the terrified, reproachful disciples to waken Him to still the storm! He would certainly have done it. 5] Nothing troubled the Lord. “How is it that ye have no faith?” What do we say to this? Why do we tend not to exercise faith when we need to most? Here are some reasons which may help us avoid this for the future. verse 40 “Why are ye so fearful?” The emotion of fear and the exercise of faith are opposites; and mutually exclusive. Where one is, the other cannot be. In this instance, fear pushed out faith. Therefore, before fear takes hold, remember the Lord, and do what the prophet says, “I will trust, and not be afraid” (Isaiah 12:2; cf Psalm 56:3). If you go from fear to faith, you go from fear to Him. 2] Unbelief remains in us. It is part of the “sin that dwelleth in me” (Romans 7:17). Being our old nature, it will always make exercising faith a struggle. Every grace has its opposite corruption to oppose it. And faith has to contend against unbelief. This is why the father of the demon-possessed boy “cried out, and said with tears, Lord, I believe; help thou mine unbelief” (Mark 9:24). The encouragement, though, is that the Lord heard this man’s struggling prayer OF faith! The Lord is greater and kinder than our faltering faith. 3] We forget past deliverances. These disciples had already seen instances of the Lord’s power. For example, the deliverance of the demoniac in the synagogue (Mark 1:23-28); Peter’s mother-in-law healed (1:30,31); many people healed, and delivered from demons (1:32-34); a leper cleansed (1;40-45); the sick of the palsy made whole (2:2-12); the man with the withered hand cured (3:1-5). For our part, we have seen His grace and goodness many times. Do we think our current storm of trouble is unique and beyond the Lord’s ability to come in for us? Having proved Him in the past, let us rise to the opportunity of proving Him in the present. Let faith go back to its Ebenezers and on to its henceforths! 4] Because faith looks beyond what is seen and temporal. In this instance, however, what the disciples saw with their eyes took them over. They did not use the eye of faith that looks beyond to Him. David, too, was aware of this, “I had fainted, unless I had believed to see the goodness of the LORD in the land of the living” (Psalm 27:13). Let us look beyond and above our present distress, and believingly look to the Lord! 5] We are not enough in the Bible. God’s word is the greatest faith-building means of grace: “faith cometh by hearing, and hearing by the word of God” (Romans 10:17). The Scriptures bring us into heart-acquaintance with Him Who is the great Object of our faith (Acts 20:32). The word of God leads us to the God of the word; it makes Him real to the soul. Yet, when all is said, the disciples’ reaction was prayer, “they awake him and say unto him, Master, etc.” (verse 38). If at least our fear drives us to Jesus, is not all wrong. The cry to Him, even of half-believing panic, brings us His help. Their faith was weak, but their prayer was strong. The comfort is that despite His gentle question, He did not rebuke them, but the storm. Let us humble ourselves and confess our unbelieving fears and sinful distrust. Let us pray to the Lord to increase our trust, that we might be strong in faith, and give credit and glory to God. They never forgot this lesson. Peter especially, years afterwards wrote, correcting the unworthy reflection on the Lord, and knowing better now, “Casting all your care upon him; for he careth for you” (1 Peter 5:7). … and he bringeth them out of their distresses. He maketh the storm a calm, so that the waves thereof are still. Then are they glad because they be quiet; so he bringeth them unto their desired haven. And that haven is into His arms, upon His bosom – to be safer in the storm with Him than in the calm without Him.